This past weekend was a long one and I took an extra day off from work so that I could get some much needed yard work done. I was hoping to get started on my mom’s chicken coop as well, but alas, a large crack in her garage foundation that ran the length and depth of her slab got priority this weekend. Anyway, in the midst of all this, I ran into a couple of things that I would love to see the design world change, so I thought I’d share. My garden beds are huge and when my neighbor cut down his 28 trees, it was interesting that the type of weed that infiltrated my yard was of a much hardier and deeper rooted variety. I couldn’t have done it without a trusty weeder and hand trowel. 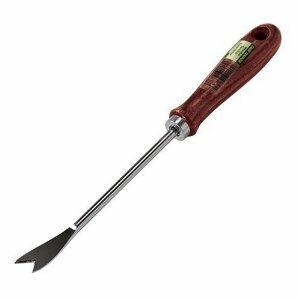 You know what though, these tools have what I think is a major design flaw and I have no idea why garden tool designers have not thought of this sooner.During my weekend of weeding, I lost my trowel and weeder at least 27 times. In fact, I lost my weeder completely and had to go buy another one. Now I understand the aesthetics of trying to cater to an earthy crunchy tree hugging crowd by wanting to make their tools look “natural” and eco friendly, but these tools stink when it comes to finding them in a pile of dirt. Why in God’s name would you make your garden tools blend in with their environment? You know what color my new weeder handle was? Green. My shovel is grey. Just great. Make your garden tools blend in with the surroundings, so every time you put them down, they get lost. In my opinion, all hand held garden tools should be fluorescent orange or an equally obnoxious color, so that when you put them down, you can easily scan your yard to find them again. This has got to be one of the most annoying oversights in customer needs I’ve encountered in a long time. I may just buy some bright colored electrical tape and tape the handles so I can find the damn things. There were no bright colored tools to be had at my local Home Depot and even Amazon’s extensive inventory of gardening tools didn’t turn up any clear winners in this category. I think there’s an opportunity for some product differentiation here. Back after I finished renovating my bathroom, I decided to go all out and buy new accessories for my toothbrushes, etc. Do you know that at the time, there wasn’t a single holder in the 20 or so options that could accommodate the thicker handle toothbrushes that are popular now? I even posted a linked in question on the designer’s forum asking why this would be. Obviously, this is not a new trend, yet the holders are still only good for those old skinny brushes. Several designers sited tooling costs to switch to a different design and that it is a commodity item, but at some point, you need to have your product function for it’s design purpose. They actually do make a few larger sizes now, but the lion’s share is still the small holed kind. Calphalon makes some of the nicest cookware around and you pay a pretty penny for it too. Back when we first moved here, my husband’s roommate loved to cook and he had a full set of these bad boys, while my spaghetti and pizza eating husband had the $20 Faberware spaghetti pot and not much else. He took great joy in ragging on his roommate for having a $100 frying pan who’s handle you couldn’t touch because it got hot. (Well, actually, you could use it if you bought the additional $30 handle sleeve accessory.) It’s rare that I actually go from stove top to oven..I have oven tools and stove tools, and rarely they mix. I don’t see any value in having a big heat conductor as a handle for any cooking instrument. The handle should be made out of an insulating material like plastic or wood. I’m amazed that these models are still as popular as they are today over a decade later. I guess it doesn’t occur to most newlyweds who want the best that their slick looking new pans will burn them if they decide to actually touch the handle while in use. It’s not necessarily intuitive to the buyer that this would happen. Now, I know the manufacturer has since modified their design and have a “cool touch” handle option, so at least Calphalon is listening to their customer feedback and modifying accordingly. I had a car key chain on one of my crappy company cars (Chrysler Minivan I believe) where the panic button was directly opposite and under my door unlock key. So, as a result, when I would hold the keychain between my two fingers, half the time, I would press the panic button instead of the door unlock button. It was a very bad design and I don’t know how it passed user testing without someone figuring that one out. The crazy ticking wall clock. When I first moved in with my husband, I had this wall clock that I would find buried in the couch cushions on a regular basis. Apparently, it ticked very loudly and it would keep him up with the tick tock, tick tock sounds at night. I actually never noticed it until he pointed it out to me, and then it became like chinese water torture. I eventually got rid of the clock. Another design trend I actually would like to see reversed is the glossy handles on appliances. I’m constantly maniacally cleaning my fridge and microwave door handles because they are always covered in fingerprints. I would happily go back to a textured finish on those accessories, but the sleek look of polished stainless rules at present. When I was shopping for stainless appliances a couple years back, they didn’t even make them with plastic door handles anymore. I wonder if stainless steel will go out of fashion due to the high maintenance time required to keep it clean. I’d love to hear if you have any design suggestions on products you’ve come across lately. As always there are opportunities around every corner for product improvement and innovation. I know I’m missing others, so please chime in with your own product improvement ideas. DH has a book on this stuff in the bathroom (it has a great picture of the worlds worst coffee pot design on the cover). It is insane how badly so many things are designed. What are they thinking? I hear you about the stainless steel. I have afriend who sells high end appliances. I hope to redo my kitchen in the next little while. I have aske dfor anything but stainless steel . I bought it when my kids were 1,3,5,7, now 15 years later it is still a pain. Next go round they are going to be behind cupboards what ever they call that look.I’m always late to the curve, I’m trying to think what will take the place of granite . I HATE when the handle gets hot! I always get fooled. Lol. The Caphalon thing is so funny. Letting the handle gets hot is not only a pain but also unsafe if you ask me. I would grab that thing and drop it on my foot as a reaction to protect my hand. If I think about it I have seen a few design mishaps myself. Sometimes we will put our frying pan in the oven so plastic or wood wouldn’t work well there but there are certain metals that don’t get as hot as others. 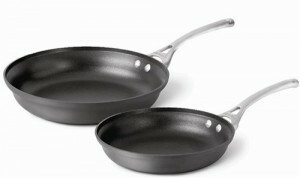 We have one cooking implement that goes from stove top to oven and back again- our cast iron skillet. But everyone in our house knows not to touch that thing without a hot pad. We have a mix of cast iron and Visionsware (not sure how that is spelled; too lazy to run to the kitchen and look…), so most of our handles get hot. Even lid handles, sometimes. I’m so in the habit of using pot holders to grab handles and lift lids that I’m not sure I could forget. I’ve been known to grab a pot holder to put a (cold) baking sheet in the oven. Would be a good thing for manufacturers to think about, though! I thought we had some fluorescent gardening tools, but I can’t remember where they came from. Maybe Lowe’s Hardware? They’re as old as dirt, in any case. I have seen some with more ergonomic handles lately, and that’s nice. The toothbrush holder with small holes is so annoying! We have lovely wood toothbrush holders that my husband’s dad made for him. We don’t use them, because they won’t hold any toothbrushes we can buy. Arrgh. Also agree with you on the keychain with the badly placed panic button and the LOUD wall clock. Why, why, why? Great post! the frying pan handle is one of the most annoying things in the world for me! mine does not heat up too fast but over time it gets really hot. Of course, the company sells handy little silicone things that you can cover the handle with so they dont get so hot. The hot pan handles are very annoying! I’d also agree with the glossy appliance handles. My husband is constantly cleaning the fridge door handles due to finger prints. Dumb designs! Regardless of the brand – and I’m guessing this happens across different brands/companies – the hot pan handles are so ridiculous. I don’t care if the pan might be great quality otherwise, I don’t want to use it if my hand will be seared in the process of cooking! I agree with you on this one, great example. I would this is one of the best ever articles that I have read so far. Most of the time due to hot pan handles the women get their hands burnt unnecessarily. It’s scary and unsafe at the same time. Though I hardly cook by myself, I will let my mom read it it out. I am sure It’s going to be truly beneficial for her all the way. Thanks a lot for sharing.